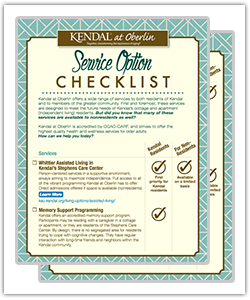 Find out services Kendal at Oberlin offers to both residents of Kendal and to members of the greater community. First and foremost, these services are designed to meet the future needs of Kendal’s cottage and apartment (independent living) residents. But did you know that many of these services are available to nonresidents as well?